The Parliamentary Environmental Audit Committee has accepted the main recommendation of the Stop HS2 campaign to minimise the environmental impact of HS2, in agreeing that the line should be slowed down to 186mph, the same speed which Eurostar trains travel on HS1. The committee is also asking that budgets for environmental protection should be ringfenced, echoing concerns of the campaign that ‘get-out clauses’ have been inserted into the HS2 Hybrid Bill, meaning environmental protection could be sacrificed as part of cost-cutting measures. The committee also warns that the proposals would endanger rare species and criticise HS2 for not conducting surveys along almost half of the route. The report from the Environmental Audit Committee can be found here. 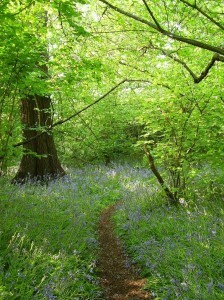 Ancient Woodland – HS2 Ltd can’t see it for the trees. “HS2 Ltd have persistently ignored environmental concerns at every level in their plans. From the very basic decisions about speed and route, they have designed a £50 billion railway will have a devastating effect on the environment. This is not just because the speed means that HS2 will blast through sensitive sites. Even HS2 Ltd now say that carbon emissions from building HS2 will exceed carbon savings for over 60 years. HS2 Ltd Chose Most Destructive and Cheapest Option for Phase 2b. HS2 report is ‘Stating the bleeding obvious’, but will anyone listen? Pingback: STOP HS2 | HS2 Environmental Statement – More people leave form blank than support HS2. That is indeed a shame Peter. However it would be a reasonably easy exercise to calculate the drop in “Benefits” caused by the lower Value of Time Saved. This will no doubt run into £ billions and is effectively an error in the calculation. That lower benefit can then, at the tipping point, be used to calculate the cost of carbon emissions. That in turn puts a price on the initial carbon footprint. That too has been left out of the equations. Analysis of the Crossrail 500 petitions indicates there are several different situation when costs are sought for compulsory purchase compensation, for inability to sell property and for relocation of businesses. There was clever use of professionally prepared petition text by the 3 main Parliamentary Agents. There were very clear phrasing of the text. The commercial and residential petitions were well structured. There was concern of Crossrail about below ground rights because of the tunneling in London. The House of Commons petitions can have the text extracted using the copy text function in ADOBE to copy onto a Word Document. With some exploration you can find text which represents your situation whether owner, lease holder or renter, or business owner or farmer. It is suggested that some groups share costs for professional templates which can be cloned to specific addresses and petitioner or petitioners. The £20 and the perception of difficulty is deterring some people but this will reduce as mutual help and the Dads Army and the Womens Institute and the Students mobilise their mutual help and extend the reach. If housing associations are willing to produce professional templates for their residents and for other house and flat tenants and owners people can assert their citizen rights. Suggest more petition structuring and arguments help are provided as the Crossrail templates demonstrate the clever ways the professional property companies and others were able to do. Also you currently have only 2 or 3 weeks in May to respond so start now. Understand from the Hybrid Bill documents what works orders impact your property and or land and what plots will be compulsory purchased. Thank you and please petition to protect against the losses and impacts. It is not too late to change the HS2 situation for you and your family albeit you face denial and stuborness from Cameron Clegg and Miliband currently. Although the EAC’s report discusses, in paragraph 14, the impact that speed has on route alignment and the consequent ability to avoid environmental damage, the reason for the Committee’s recommendation to reduce the speed is to lower carbon emissions. However, the Committee only sees this reduction as necessary “until electricity generation has been sufficiently decarbonised to make [emission levels] a marginal issue”. Sadly, this means that the Committee is not saying that the route should have been designed for a lower operating speed, just that the train speeds should be limited pro tem.